Your Christmas wishlist just got bigger—Barbie and Puma are about to drop something epic. To celebrate the Puma Suede’s 50th birthday, this latest collab features Barbie’s signature pink complete with her logo throughout. 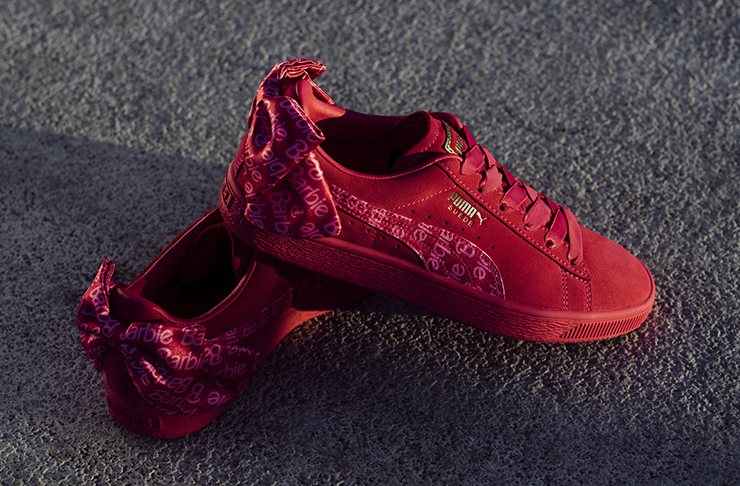 Our top pick (if we had to choose), is the Suede 50 silhouette. From Barbie’s wardrobe to yours, the black suede body features bold pink hues complete with an oversized bow on the heel. It also comes in an extra-fabulous full hot pink option. You’ll also want to put some coin aside for the backpack. Complete with bold cuts, pink straps and golden embellishments and a bow, it’s the thing of Barbie girls (and boys) dreams. With leggings, a sports bra, hoodie and even a baseball cap available, we’ve already forgiven you for kitting yourself out head to toe. Dropping worldwide next Thursday online and in select stores, this collection is not one to miss.